The Ferrari 333 SP n.3 is a prototype that participated in the 24 Hours of Le Mans in 1997. In 1994 Ferrari decided to return to competing in the Sport Prototype races but not officially, but offering a car to its customers. The 333 SP was designed by Dallara and fitted with a Ferrrari engine with concepts derived from Formula 1. In the five years that followed the Maranello house, it entrusted the modifications to Michelotto Automobili. 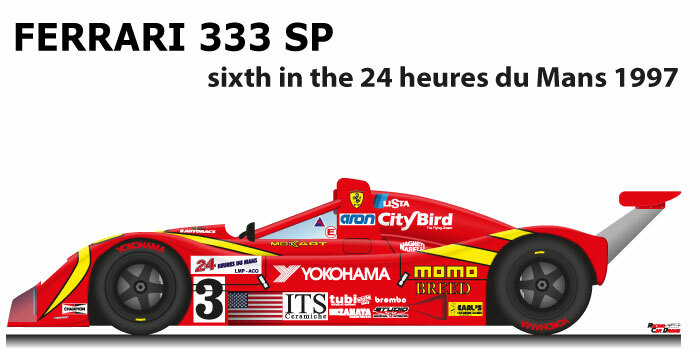 Giampiero Moretti, Max Papis and Dieder Theys with the Ferrari 333 SP n.3 arrived sixths at the 1997 Le Mans 24 Hours. It was the best result of a Ferrari 333 SP at Le Mans. The Team Moretti Racing car can start from the third position on the grid, during the race it suffered a gap of twenty laps from the TWR Porsche WSC n.7 of Michele Alboreto, Stafan Johansson and Tom Kristensen winners of the race. Ferrari F130E 65° V12 3997 cc, aspirated.